Anthony Stolarz is trying to break through among a crowded field of goalies. The numbers don't add up. They never have for Central Jersey native Anthony Stolarz. Two seasons after appearing to be very much in the Flyers future, one season after a second major injury to his left knee seemed to have forever written him out, he is at the Flyers' training camp in Voorhees, competing for a spot in a crowded goalie field. 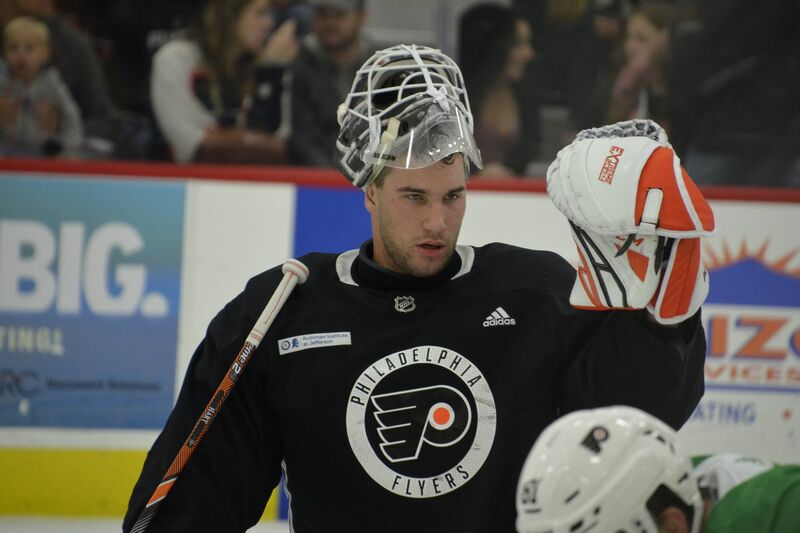 The Flyers have in camp, in no particular order, the following men in blockers and pads: Brian Elliott, Michal Neuvirth, Alex Lyon, Carter Hart, Stolarz, and camp invitee Liam Hughes — the ultimate dark horse (and wearing dark pads no less). Barring a training camp injury, the favorites for the big club are the same two who began last season here: Elliott and Neuvirth. That would send Lyon, Carter, and Stolarz to start the season in Allentown, a crowded field made more complicated by the need to season Hart, the Western Hockey League's three-time goaltender of the year who added the league MVP award last year, in his final season in juniors. "Hexy's message was, 'Come in here and you're going to have to take a veteran's job,' " Stolarz, a second-round pick in 2012, said during the second day of training camp Saturday. "I'm just trying to go out there and show that I have a lot of game left in me. And that I can compete at a high level and a consistent level." And a healthy level. Indeed, one reason Stolarz, now 24, is still wearing Flyers colors is that the team hasn't exactly been lucky when it comes to goalie injuries. Both Elliott and Neuvirth have been sidelined for chunks of their previous seasons. Both are returning from surgeries over the summer – Elliott to shore up the abdominal injury that sidelined him at the end of last season, Neuvirth to fix both hips. Given that track record, it's not unreasonable to believe that any three-way goalie rotation for the Phantoms to start the season will be short-lived. The irony may be this: Stolarz said when he had an MRI of his left knee three weeks ago, "They said it was the best my knee has looked in a few years. "So when you hear something like that you kind of let everything go and just go out and play. "Really, I'm just taking it day-by-day," Stolarz said. "Not trying to look at what's going to happen a month from now. Or even a week from now. I can only control the present. I'm just jacked up to get in some preliminary games." The first of such games will be against the Islanders at Nassau Coliseum Sunday at 1 p.m. Stolarz and Lyon will play, Flyers coach Dave Hakstol said. It will be Stolarz's first NHL action since April 9, 2017 – a 3-2 shootout loss to the Carolina Hurricanes. "Obviously they still see something in me or they would have just let me go," he said. "You take that as a positive. Six years ago, they believed in me the most. I want to prove my worth … My job is to go out there and show that I do have a lot left in the tank." One of the more interesting camp combos has Travis Konecny paired with 21-year-old Phantoms center Mikhail Vorobyev. A third-round draft pick in 2015, Vorobyev had nine goals and 20 assists in his first season with the Phantoms last season. He has played well in development camp and during the Flyers rookie camp last week, and is considered a dark horse in the battle for third-line center. "He's a special player, to be honest," said Konecny. "He's a really smart player. He's got a lot of skill. You can see why they drafted him. He's a pretty unique player. There's not a lot of guys like him."